I'm here at Thunderhill Raceway, getting ready for some 24 Hours Of LeMons action this weekend, and the talk in the pits is all about the misfortune that has befallen the Peugeot 505 Turbo team. 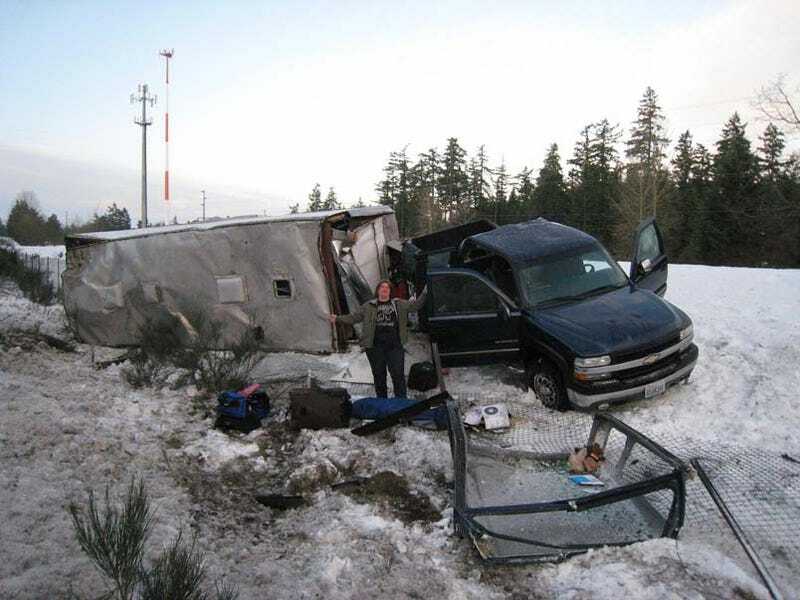 It seems that the crazy winter weather in the Pacific Northwest, in addition to preventing some teams (including the beloved Size Matters Plymouth Fury) from getting here at all, caused the wreck of the Surrender Monkeys' tow vehicle and trailer on the way to California. To say we're all disappointed would be the understatement of the day, but a big sigh of relief was breathed when we got word that nobody was hurt in the crash. We're hoping to see these guys at the Reno race!